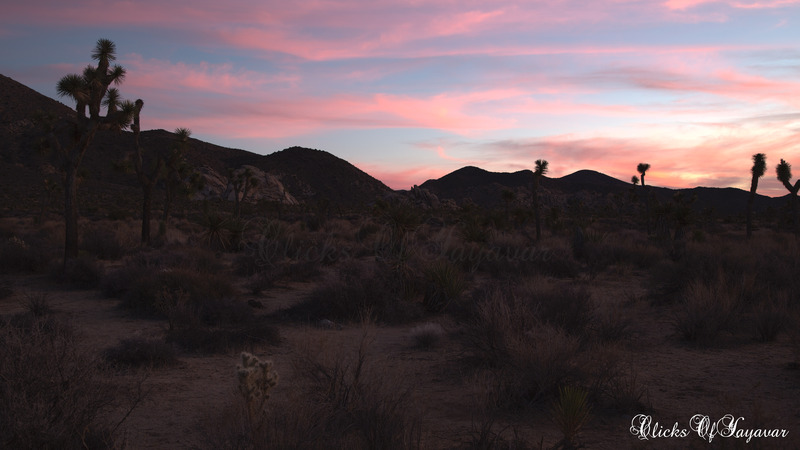 … a fine evening in desert of Joshua tree national park, California . Light from setting sun was softly refracted in sky, looked like nature was all set to spread colors on its blue canvas. 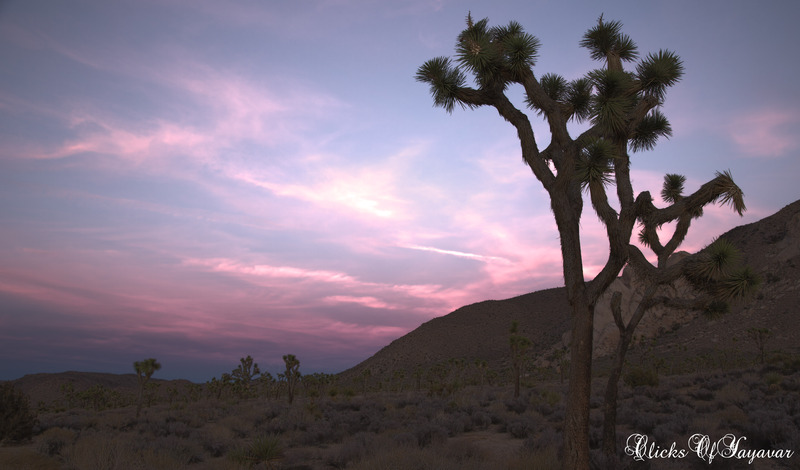 …all eyes saw was changing colors, Joshua Trees and desert. No wonder one such view in this desert reminded, few Mormons, of Joshua praying with hands reaching sky. Looking at this vast and beautiful calmness, just miles away from supposedly most technically advanced places on earth, You stare in awe at the nature and beauty of nothingness. (Kurt Vonnegut said – “everything is nothing, with a twist”… I think he had more than just symbol of zero and infinity in mind, when he said that). “…I suddenly became aware of my whole environment as being engaged in a gigantic cosmic dance. Being a physicist, I knew that the sand, rocks, water and air around me were made of vibrating molecules and atoms, and that these consisted of particles which interacted with one another by creating and destroying other particles. I knew also that the Earth’s atmosphere was continually bombarded by showers of ‘cosmic rays’, particles of high energy undergoing multiple collisions as they penetrated the air. All this was familiar to me from my research in high-energy physics, but until that moment I had only experienced it through graphs, diagrams and mathematical theories. As I sat on that beach my former experiences came to life; I ‘saw’ cascades of energy coming down from outer space, in which particles were created and destroyed in rhythmic pulses; I ‘saw’ the atoms of the elements and those of my body participating in this cosmic dance of energy; I felt its rhythm and I ‘heard’ its sound, and at that moment I knew that this was the Dance of Shiva, the Lord of Dancers worshipped by the Hindus.” – Fritjof Capra in Preface of the book “The TAO of Physics”. 11 Jan	This entry was published on January 11, 2014 at 2:36 PM. It’s filed under National Parks, US National Park and tagged California, Joshua, Joshua Tree National Park, Joshua Trees, Kurt Vonnegut, Sunset, Tao of Physics. Bookmark the permalink. Follow any comments here with the RSS feed for this post.